Create a shimmering waterfall effect. Outdoor lighting applications are a great way to create a mood of ambiance and romance within the landscape. One way that Outdoor Lighting Perspectives of Nashville utilizes light to create a mood enhancing effect is through the use of LED ribbon lighting. This ribbon lighting is often used in recreational setting such as pool and water feature lighting, deck lighting and under bars and shelves in outdoor kitchen and bar areas, and under built-in seating and benches on patios and decks. Ribbon lighting exudes a very even, soft and romantic light. The added positive attribute to LED ribbon lighting is since it is LED, it is as easy on the environment and pocketbook as it is on the eyes. LED ribbon lighting for use in underwater applications. 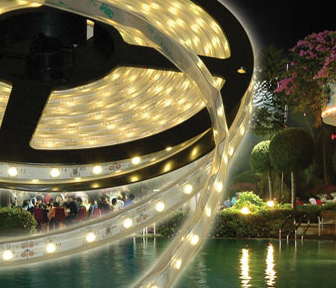 LED ribbon lighting is used in and around pools and water features and is completely submersible and is very effective in delivering even light with an effect that is unforgettable. They are often used under the ledges of waterfalls to add a distinctive glow to the water that spills out from the water feature, creating an unforgettable result. Can you imagine a midnight swim in your pool under the glow of these dreamy lights? 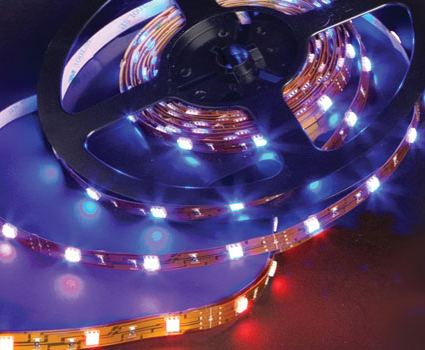 We also offer colored LED ribbon lighting for specialized applications. With the installation of LED ribbon lighting your outdoor structures will become a relaxed place of refuge when entertaining, or just enjoying an evening at home. This unique outdoor lighting implement is a force to be reckoned with when used within the landscape in conjunction with our quality lighting fixtures. The technology of these lights add another chapter in the book of beautiful outdoor lighting design. 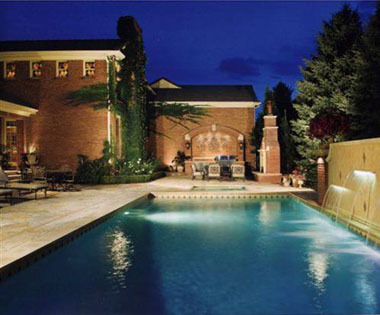 Outdoor Lighting Perspectives of Nashville currently installs a tremendous amount of LED ribbon lighting which hosts the warm white light aspect of the light, however, there is color changing LED ribbon lights which can be used for a particular setting or used in a specialized application to achieve maximum effects. This entry was posted in Deck lighting, LED, LED pool lights, LED ribbon lighting, Light Bulbs, Outdoor Lighting, Outdoor lighting design, Outdoor Lighting Installation, Outdoor Lights Nashville, Pond Design, Pool Lighting, Residential outdoor lighting, waterfall lights and tagged Deck lighting Nashville T, Landscape Lighting, LED lighting Nashville TN, LED Ribbon Lighting for Pools and water features in Nashville TN, LED Ribbon Lighting Nashville TN, Lighting effects specialist Nashville TN, lighting specialist, low voltage, Outdoor Lighting, outdoor lighting Nashville, outdoor lighting perspectives, Pool LIghting Nashville TN, Pool Lightng Experts NashvilleTN by John Groce. Bookmark the permalink.